This verdict is well illustrated by the recent study of Rodrigo Pedreira (2018, see reference below) off the North East Brazilian coast. His Rare Earth Elements (REE) data reveal marked positive Gadolinium (Gd) anomaly which reflects the release of Gd in hospital and domestic effluents. Indeed, this element is used as contrasting agent in magnetic resonance imaging (MRI) to enhance clarity of diagnosis. The authors estimated that between 700 and 2000 g Gd d-1 are discharged into Tropical and South Atlantic waters due to submarine outfalls. While the Gd complex behaves conservatively and can be used as a new tracer for sewage discharges from submarine outfalls in ocean waters, it is also clear that high technology wastes are distorting the use of REE as "natural" tracers. 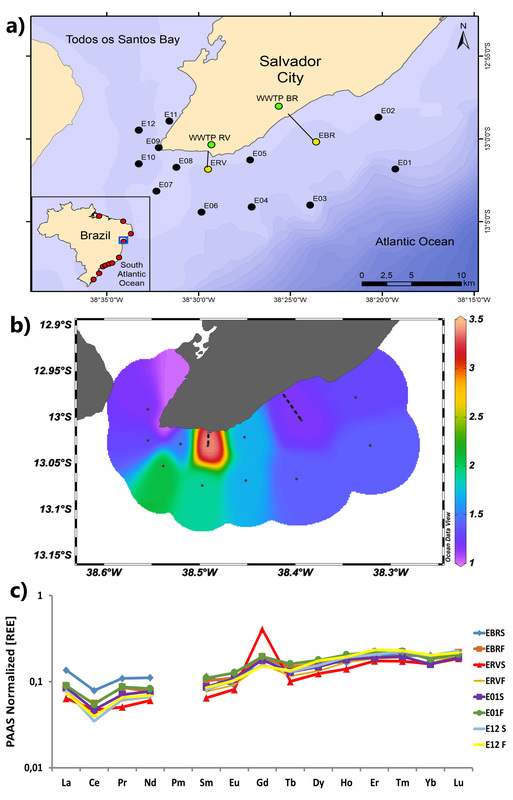 Figure : Sampling took place (a) off the northeastern coast of Brazil, whereas discharges of submarine outfalls located along the coast of Brazil (a insert) were used to estimate order-of-magnitude emissions of anthropogenic Gd to the Atlantic Ocean. A plume of Gd anomalies (Gdsn/Gdsn*) can be clearly identified for surface waters (b). Positive Gd anthropogenic anomalies are observed in shale (PAAS)-normalized REE patterns (c) for surface waters (S) in most stations in the proximity of submarine outfalls (ERVS and EBVS). Click here to view the figure larger.